The latest edition of the IAM Journal is online and will be at the doorstep of IAM members soon, if it hasn’t already arrived. 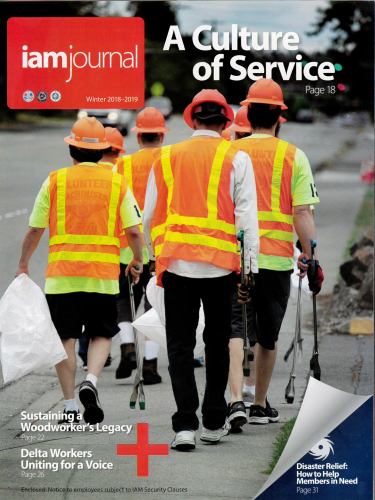 Throughout this edition of the IAM Journal, you will read about the culture of service that is engrained in our union. It is filled with stories of members helping members and their communities. Whether it’s getting food to the needy of the Northwest and Midwest, training displaced members in the South or mentoring a deceased woodworker’s son, our members selflessly do what it takes. You’ll learn how the IAM led the charge to beat back right-to-work in Missouri, and how a Pennsylvania member and his district creatively promote the union on the racetrack. There’s plenty more good reading for you and your entire family to enjoy throughout. You can also enjoy it digitally right now. The post The Winter 2018-2019 IAM Journal is Here appeared first on IAMAW.